Alana Schlang, 17, tells that when she was seven, she was really into wolves and huskies. When her dad came back from a business trip to Alaska with souvenirs from the Iditarod headquarters, she said she started looking into mushing magazines and books and thought “it would be so cool to be in the cold and snow all alone with the dogs.” She had to do a “Million Dollar Project” in fifth grade, pretending that she had just inherited a million dollars and writing down everything she would do with it. Her entire project was on buying property and a house in Alaska, a dog sled team and everything else she would need to be a dog musher. In 2000, she met a musher who invited her to his bed and breakfast business in Montana. She and her family took him up on his invitation at a time when they could see the Race to the Sky. After she got home she started buying dogs. Her first four were from Susan Butcher. She now has 14 dogs, five of which are from a litter from two of her original Butcher dogs. She also has dogs from Martin Buser lines and Tim Osmar lines as well as some dogs from her mentor, Jamie Nelson. 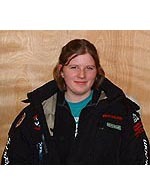 She has run some shorter races in Montana, Oregon and Idaho but this will be her first Jr. Iditarod.